When your turn begins, choose one of your installed cards. 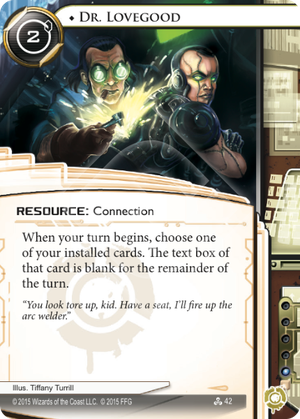 The text box of that card is blank for the remainder of the turn. "You look tore up, kid. Have a seat, I'll fire up the arc welder." This is an exceptionally cool card. I'm worried that what with the obvious synergies between Dr. Lovegood and Adam's directive cards, some of the less intuitive applications will go unnoticed. The Source: With exception of An Offer You Can't Refuse, the runner cannot steal an agenda on the corp's turn, and with the exception of Plan B, the corp cannot score an agenda on the runner's turn. What this means is that if you blank The Source at the beginning of your turn, you no longer are subject the downside of the card (having to pay 3). Drug Dealer: Because the negative effect (losing 1) occurs at the beginning of the runner's turn and the positive effect (drawing one card) occurs at the beginning of the corp's, using Dr. Lovegood to blank Drug Dealer, much in the same way as The Source, completely removes the drawback. Donut Taganes: The corp is not going to be playing events on the runner's turn. That would be madness. Using Dr. Lovegood in conjunction with Donut Taganes ensures that the tax on events and operations remains exclusively on the corp's side of the board. New Angeles City Hall: If you're running against a deck that seems more inclined to SEA Source than Data Raven, using Dr. Lovegood can allow you to steal agendas without trashing New Angeles City Hall on your turn and avoid the SEA Source tag on the corp's. Basically any card that has a mandatory loss in exchange for a situational boon. Cards such as Wyldside, Starlight Crusade Funding, and Hard at Work, could all potentially benefit from being turned off once in a while. A strategically applied Dr. Lovegood to a Stim Dealer could potentially prevent/delay the damaging drawbacks of the card and effectively turn it into a more efficient Haas Arcology AI. With an Aesop's Pawnshop or Chop Bot 3000 installed, a runner could blank a Muertos Gang Member and sell/chop it, preventing the corp from being able to rez a card for free while still making full use of the positive effect. Most of the aforementioned is likely completely un-utilizable in a competitive way, and I know that. But that doesn't change the fact that Dr. Lovegood is cool. Mechanically, it explores a really interesting space that, while perhaps not necessarily good, deserves to be thought about.